You’ll notice that the tone of this post is different than others. It’s the ramblings of a woman on the brink of insanity. 1. 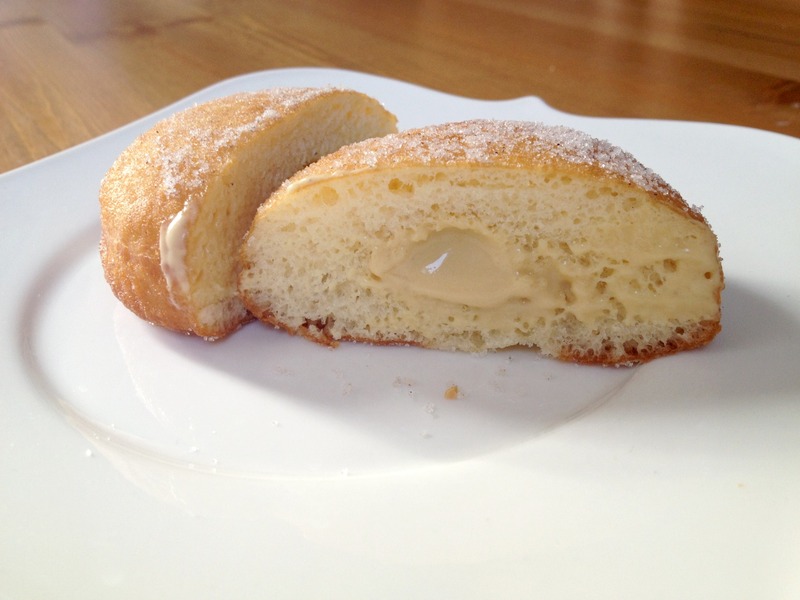 Bakery or pastry shop donuts, which are pillowy and super-rich—usually fried brioche or something just a bit leaner. They’re less about a crisp crust and more about the enriched dough itself, which has heft—it’s usually more of a bun (a delicious one that’s worth every calorie, of course). 2. Artisan-style (yep, I said it) donuts, which are sold in shops exclusive of other baked goods. They’re usually pleasantly bready—they make you feel like you actually ate something. They’re less rich than the bakery donut and usually draped in a fancy glaze or topping. 3. Coffee-shop/donut-shop/convenience store donuts, which are light as a cloud, with much less chew than the others. In some cases, they can also taste like cardboard, feel like sandpaper, and have a light but rough crumb. For my purposes, I’m putting the artisan donut in the bakery or pastry-shop category. My goal was to make something right in the middle: a donut that has chew—something for your teeth to pause on—but that isn’t chewy, and a donut that has flavor but that isn’t rich and buttery. 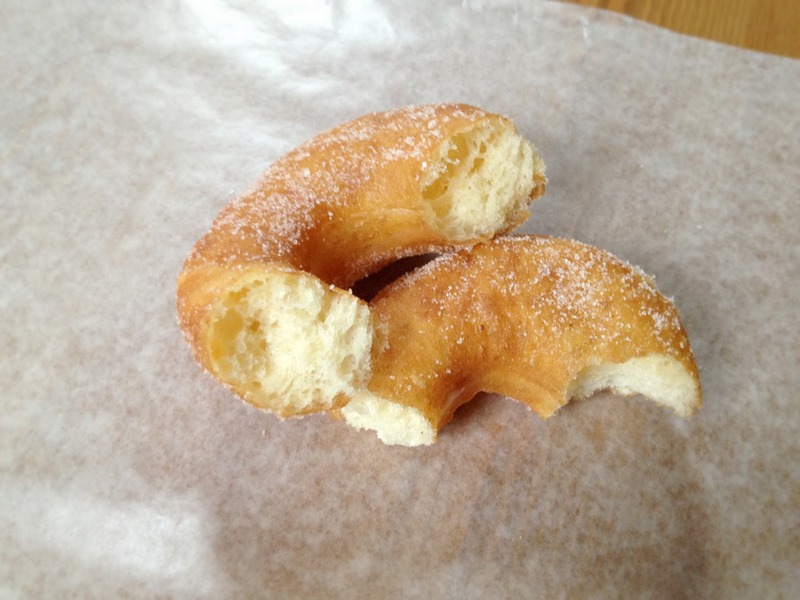 The conundrum with donut testing, however, is that it is VERY difficult to make a bad one. 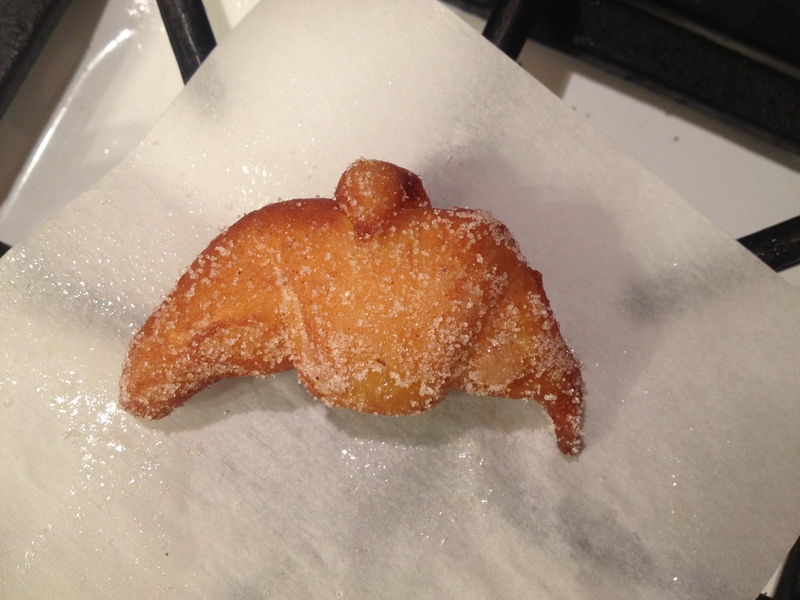 I mean it’s fried dough. 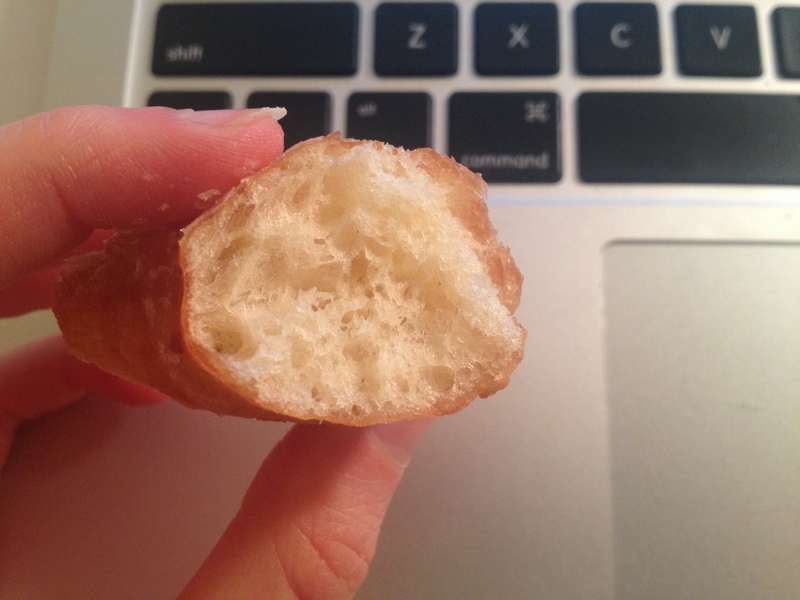 Through slight manipulations, I got (click on links for my pictures) sun-colored, rich bakery-style donuts; spongy milk breads; bubbly, chewy beignets; and a crazy-good, chewy focaccia-like dough (look at those holes!) that I need to find something else to do with. There were many comparison charts. Eventually I became so insane that there were midnight donut animals and donut challah (dollah?). 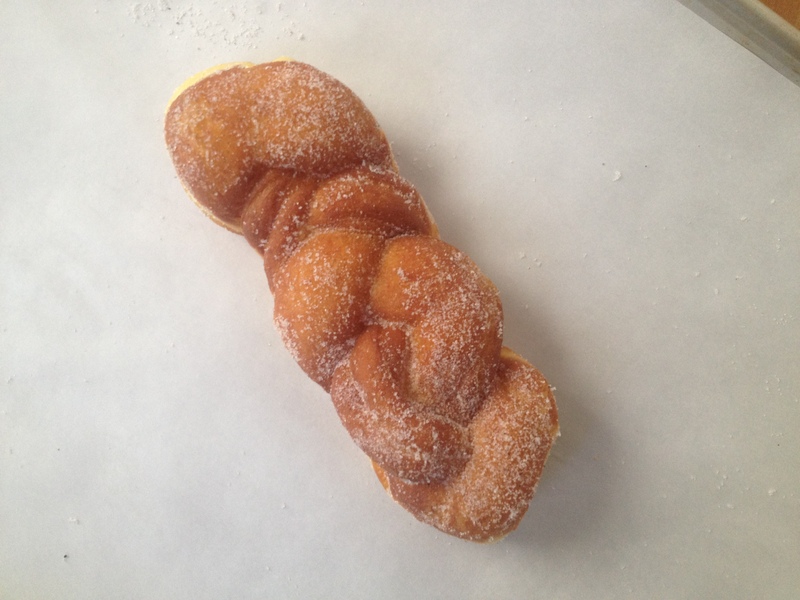 And can a donut shaped like a croissant still be called a cronut? I could use any of these recipes (except for the animals and croissants) for other applications; some were very special. But with every batch, I sought something lighter and lighter, until the donut I desired was no longer solidly in the middle of the bakery and coffee shop donuts. I felt myself longing for something closer to the coffee shop side. 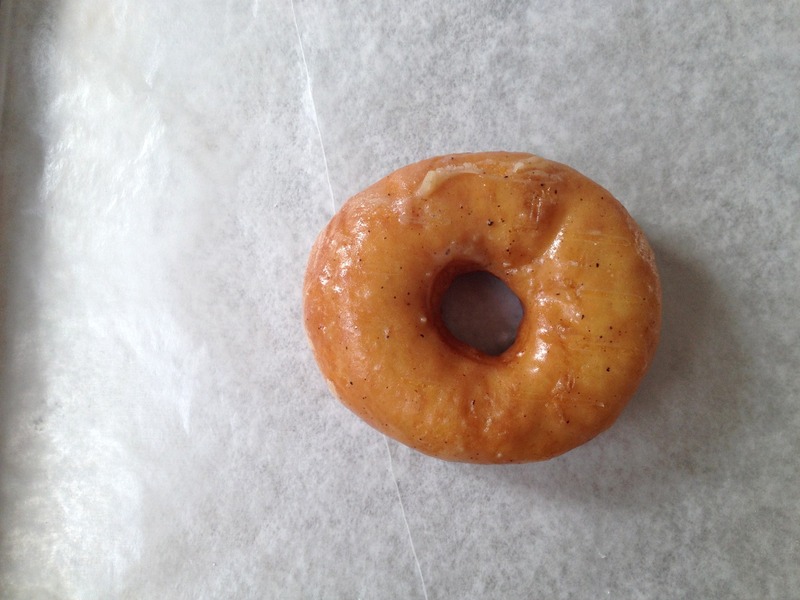 Maybe it’s because bakery donuts are ubiquitous now, but high-quality, small-batch coffee shop–style ones are not. New goal: Now I wanted something featherweight—something that, if I took a bite of it and held it in my hand while having a conversation, I might forget that I was holding anything at all. I wanted it to taste of milk and air. And what’s the enemy of that ideal? Fat. Fat from milk and fat from butter. And what does fat bring? Flavor. I’ll spare you the details of those five weeks of testing. But the conclusion was difficult for me to come to. I had a feeling things might end this way, but that doesn’t mean I didn’t try to avoid it. It is that the same dough just can’t be used for both donuts (filled and ring) when they’re made at home. Well it certainly can, but the structure required for the filled donut would create a donut a little too close to artisan or bakery-style for the ring. While the doughnut for the cardamom-coffee variety is not too rich and is lighter than many, when used for the ring, it is a bit too pillowy and a bit too closed-crumbed. It’s delicious but not what I wanted. For the ring, I wanted this. I wanted the glazed donut of my childhood—but better. What I got is not a Dunkin’ donut or a Krispy Kreme donut. But it’s light and lovely and has that ability to make you think that you can eat three without feeling weighed down. I do want to note that the important lesson is that donuts require just just just enough gluten development to support the rise and expansion that a fair amount of yeast provides—that’s what makes the donuts light. Any more than this, however, and the donut will be chewy or even tough (since we’ve already established that we can’t use too much fat here). And that’s why, as you’ll notice, kneading is kept to a minimum. It seems reckless—there isn’t even any stretching and folding involved—but the amount of liquid in this recipe is enough to initiate enough gluten development. It’s still a little reckless, but we’re making donuts here, not life preservers. So here, fussy as it may be, we have two separate donut varieties and two separate doughs. One is a round, soft, and pillowy donut filled with an intense coffee-infused, whipped cream–lightened pastry cream and tossed in cardamom sugar that gives the exterior just enough crunch. It’s all soft and cool and creamy and a bit elevated, like those bakery donuts. 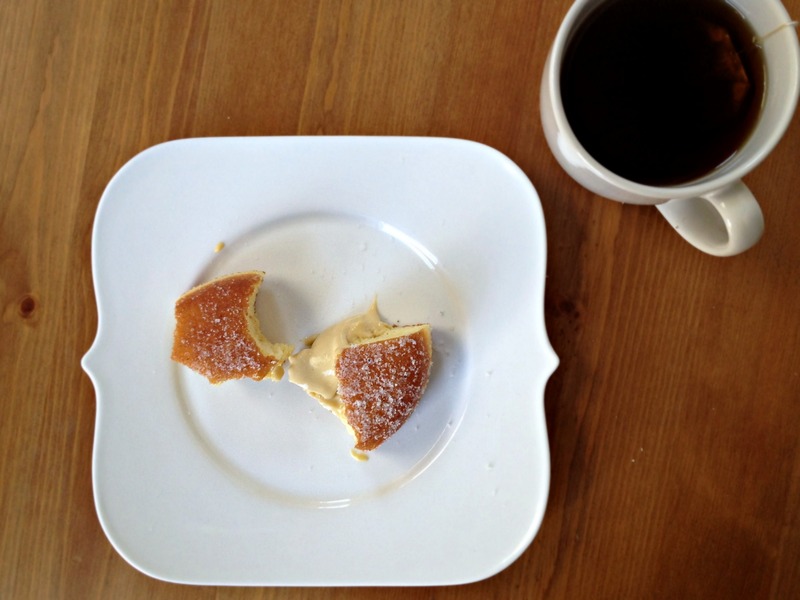 The other is a cloud-like ring that’s coated in a browned butter glaze that hardens and flakes away just like the sugary glazes on the coffee shop donuts (and unlike the gloppy-looking ones on many of the trendy donuts). The glaze, though made from sugar, is not too too cloying (thanks to buttermilk), and the browned butter adds back some of the richness that was taken out of the dough. 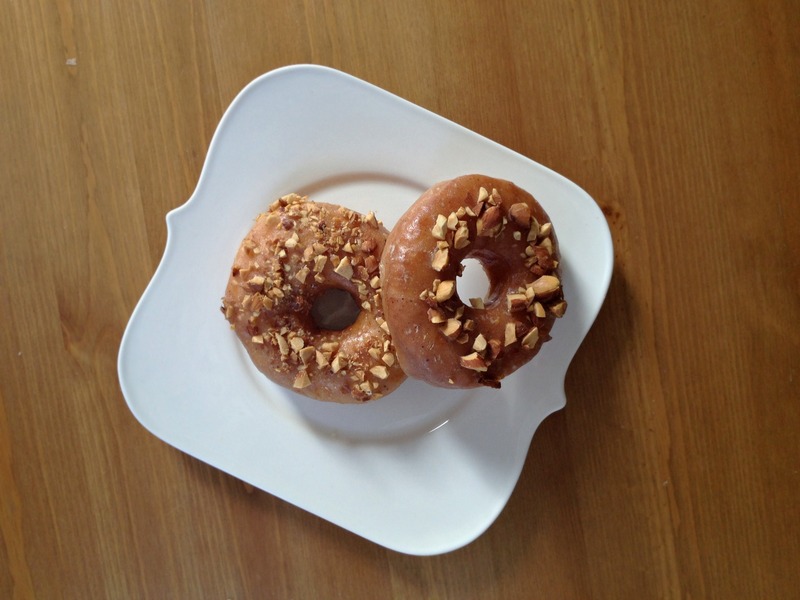 Very salty, toasty almonds give these rings interest. And that is what I call obsession. I’m so obsessed, I plan to take a good break from donuts and then come back with my ideal cake donuts and spudnuts. Stay tuned. Use 2 teaspoons yeast if you’re refrigerating the dough; use 21⁄8 teaspoons if you’re going with a room temperature bulk rise. I don’t buy vegetable shortening, but this solid fat certainly tenderizes donuts in a way that butter (~20% water) cannot. Here, I use unrefined coconut oil as a substitute (refined is fine). Like shortening it’s a solid saturated fat that works as a tenderizer. Lard would work too. If you don’t have a problem using shortening, substitute it for the coconut oil. Let’s face it: This ain’t health food. Alternatively, you can use all butter; your dough will be just a bit heavier. 1. For the Coffee Pastry Cream: Bring milk, coffee, sugar, and salt just to boil in small saucepan, stirring occasionally to dissolve sugar. Remove from heat, cover saucepan, and let sit for 1 hour to infuse with coffee flavor. Transfer coffee-infused milk and beans to airtight container and refrigerate for 8 hours. 3. For the Donuts: Using stand mixer fitted with paddle, mix 280 grams (2 cups) flour, 50 grams (¼ cup) sugar, yeast (see headnote), salt, and nutmeg on low speed until combined. With mixer running, add butter, piece by piece until it is crumbled and coating flour. 4. Heat milk and coconut oil in small saucepan over medium-low heat to 110 degrees. Add milk–coconut oil mixture, eggs, and vanilla to flour mixture, increase speed to medium low, and mix until smooth, batter-like mixture forms, about 1 minute, scraping down sides and bottom of bowl as needed. 5. With mixer running, gradually add remaining flour until combined. Switch to dough hook and knead dough on medium-low speed until no longer lumpy, about 2 minutes, scraping down dough hook and bowl once or twice. Dough will be very sticky; do not add extra flour. (Dough will not be elastic, nor will it clear the sides of the bowl.) Transfer to greased large bowl. Fold over itself a couple of times to get it in somewhat of a ball shape. Cover surface of dough lightly with greased piece of plastic wrap. Cover top of bowl tightly with plastic wrap and let rise A) at room temperature until it has doubled in bulk, 1 to 1½ hours or B) in refrigerator for 8 to 16 hours. 6. Combine remaining 200 grams (1 cup) sugar and cardamom in shallow dish. Cut out sixteen 5 x 5-inch squares of parchment paper. Transfer dough to floured counter. Lightly flour rolling pin and roll out dough 3⁄8 inch thick. Cut out doughnuts with 2¾-inch biscuit cutter, brushing bottom of each one lightly in flour on counter and placing each one on parchment square; transfer parchment squares with dough rounds to baking sheets. Cover baking sheets with plastic wrap sprayed lightly with oil spray. 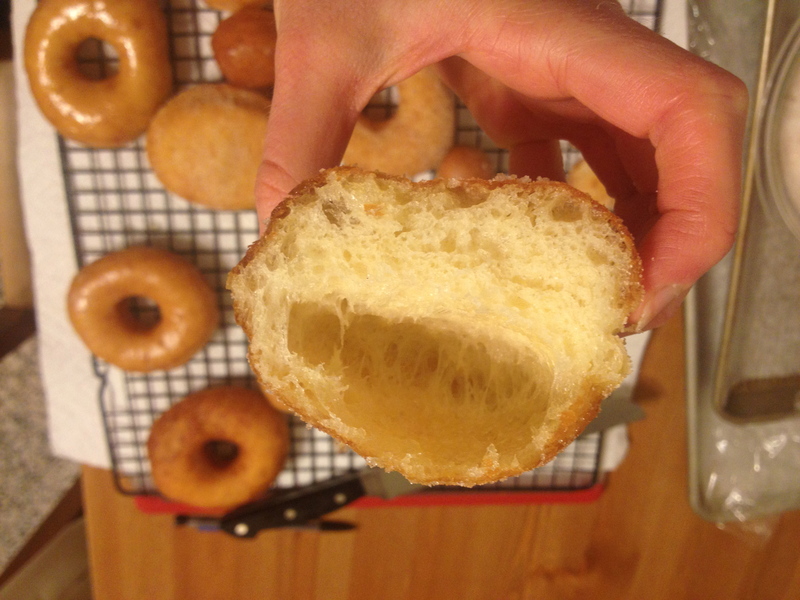 Let donuts rise until puffed (but not quite doubled) and an indentation made with your finger almost fills back in very slowly, 35 to 50 minutes. 7. Meanwhile, heat fat to depth of 2 inches in Dutch oven to 355 degrees. 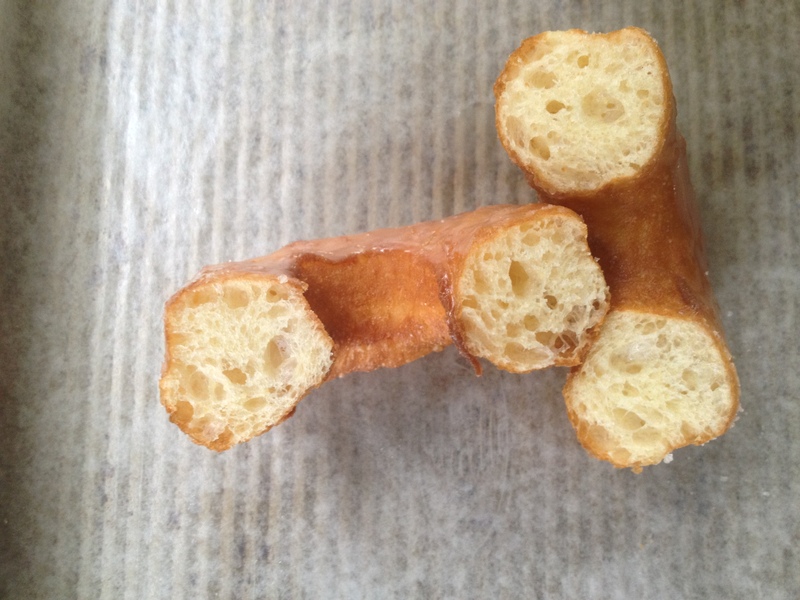 When donuts have risen, use parchment squares to transfer three donuts at a time to oil, top-side down; peel away parchment square. Fry donuts on first side until golden brown, 1 to 1½ minutes. Flip donuts and fry on second side until golden brown, 1 to 1½ minutes longer. (Adjust burner as necessary to maintain oil temperature between 350 and 360.) 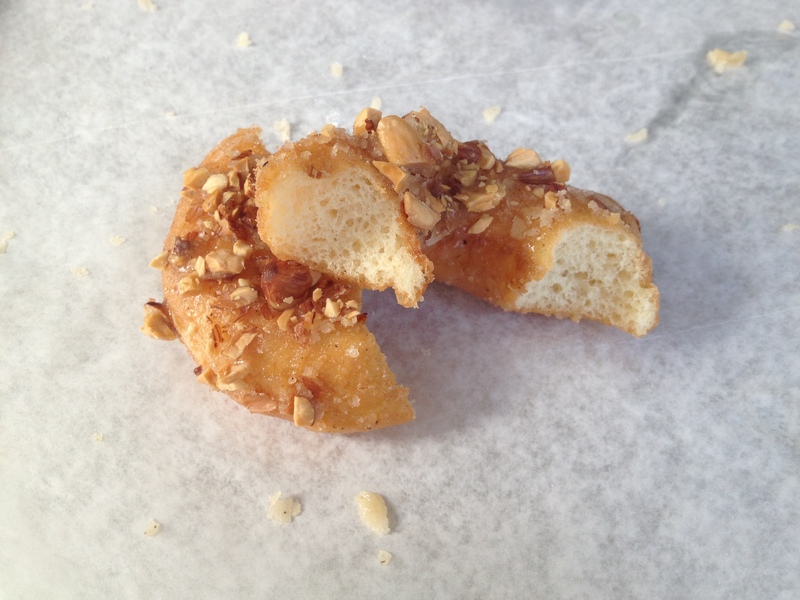 Transfer donuts to paper towel–lined baking sheet, shaking off excess oil. Let drain for a minute or so, then transfer to dish of cardamom sugar and coat. Transfer sugared donuts to wire rack and let cool completely before filling. Repeat with remaining donuts. 8. While donuts are cooling, whip cream just to medium peaks. Fold whipped cream into pastry cream. 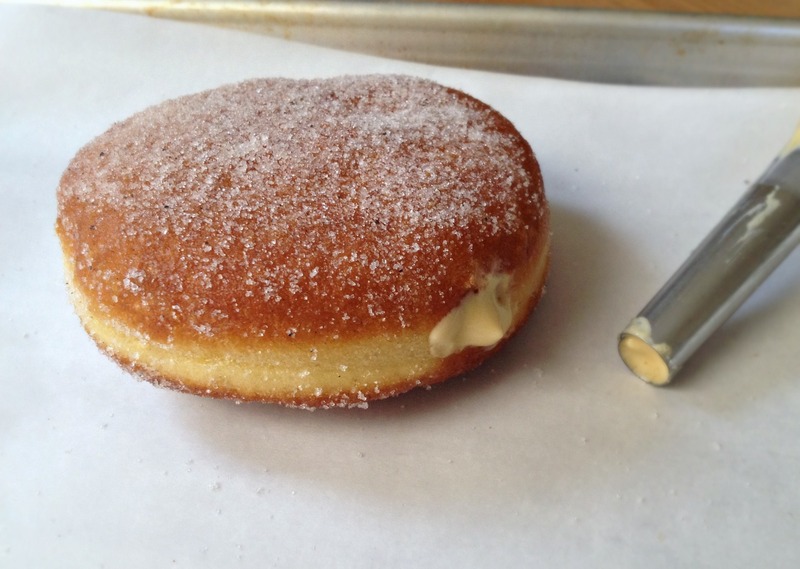 Using skewer or chopstick, poke hole in side of donut and push through length of donut without puncturing other side, creating room for cream. Fill pastry bag fitted with long round tip with cream. Insert tip as far as it will go and gently squeeze cream into donut pulling tip out as you go. Serve donuts immediately. 1. Using stand mixer fitted with paddle, mix 245 grams (1¾ cups) flour, sugar, yeast, salt, and nutmeg together on low speed until combined. With mixer running, add softened butter, piece by piece until it is crumbled and coating flour. 2. Heat water, milk, and coconut oil in small saucepan over medium-low heat to 110 degrees. Add water mixture, eggs, and vanilla to flour mixture, increase speed to medium low, and mix until smooth, batter-like mixture forms, about 1 minute, scraping down sides and bottom of bowl as needed. 3. Add remaining flour and mix on medium-low speed just until combined, 35 to 45 seconds. Give dough final stirs by hand to make sure ingredients are incorporated. (Dough will stick to sides of bowl and, frankly, look kind of gross. Do not add extra flour.) Using bowl scraper, transfer dough to lightly greased, large bowl, cover with plastic wrap, and let rise at room temperature until doubled, 1 to 1½ hours. 4. Cut out sixteen 5 x 5-inch squares of parchment paper. Transfer dough to floured counter. Lightly flour rolling pin and roll out dough 3/8 inch thick. Cut out doughnuts with 3-inch biscuit cutter, brushing bottom of each one lightly in flour on counter and placing each one on parchment square. Cut out hole in middle with 1-inch cutter. Transfer parchment squares with dough rings to baking sheets. Transfer donut holes to baking sheets. Cover baking sheets with plastic wrap sprayed lightly with oil spray. 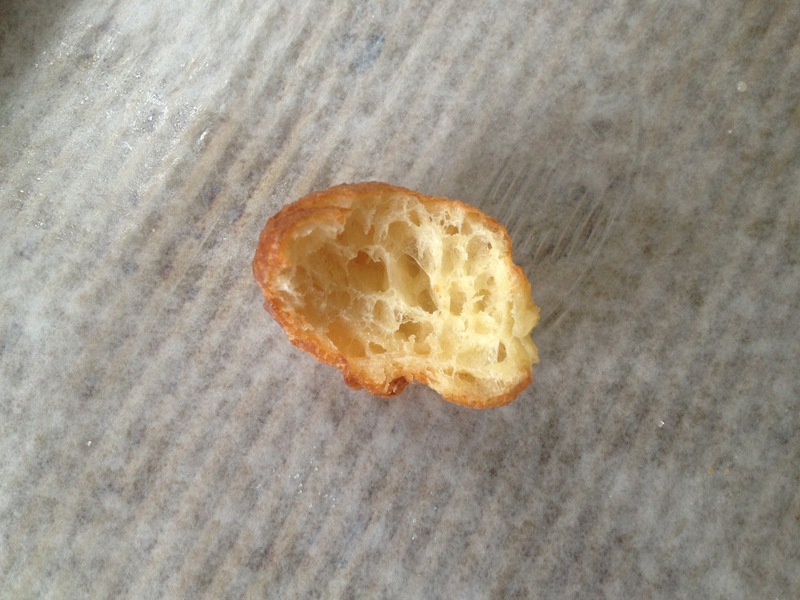 Let donuts rise until puffed and an indentation made with your finger almost fills back in very slowly, 35 to 50 minutes. 5. Meanwhile, heat fat to depth of 2 inches in Dutch oven to 355 degrees. Adjust oven rack to middle position and heat oven to 375 degrees. Place a small knob of butter (1 teaspoons should do) on baking sheet, and transfer sheet to oven to melt butter. Remove sheet from oven and toss almonds and sea salt to taste with melted butter. Spread out almonds and toast until deeply toasted, about 10 minutes, tossing almonds halfway through toasting. Let almonds cool completely, then chop. Melt remaining butter and pinch or two of salt in small, light-colored saucepan over medium-low heat. Once melted, continue to cook, stirring occasionally with rubber spatula, until milk solids have turned dark brown, liquid has turned golden, and butter smells of toasted hazelnuts, 5 to 7 minutes (stir constantly during last few minutes). Reduce heat to low, add sugar to saucepan and whisk to combine (mixture will look clumpy). Add buttermilk and whisk vigorously to remove any lumps (feel free to adjust buttermilk amount to make a glaze of your desired thickness). 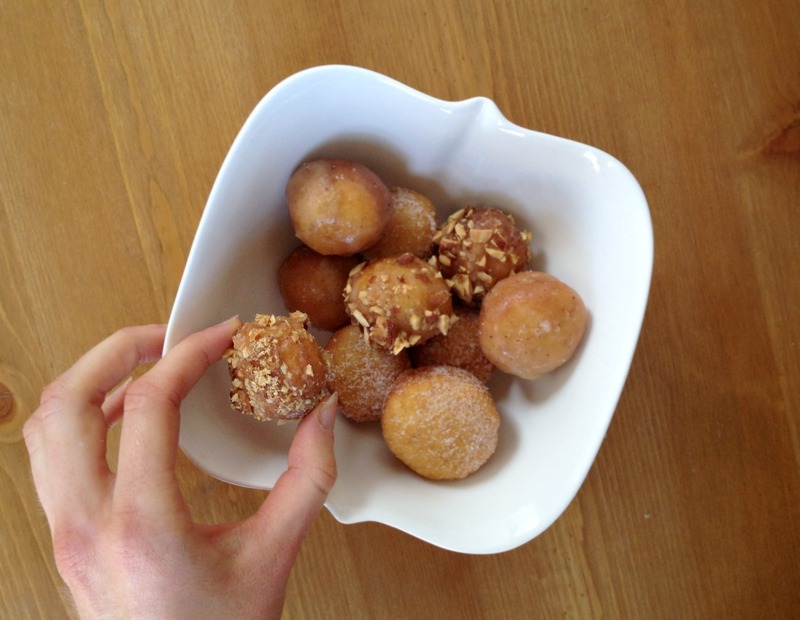 Keep glaze warm over low heat (uncovered) and whisk to remove lumps before dipping each donut. 6. 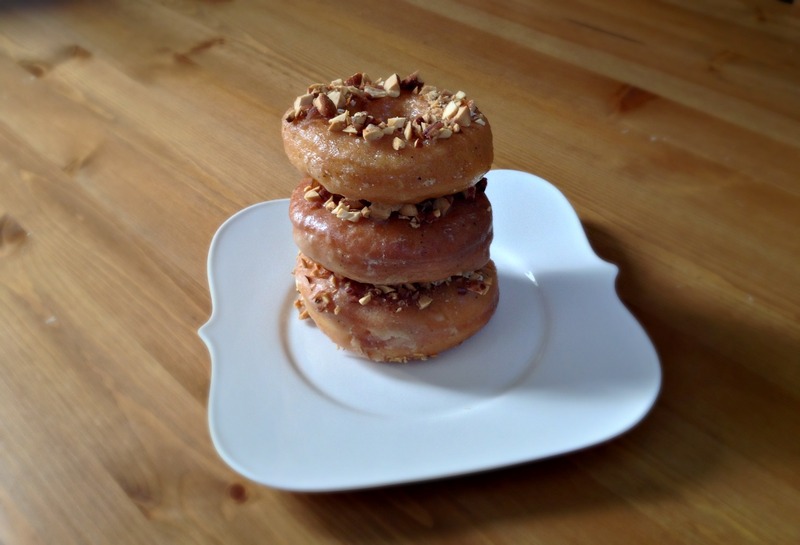 When donuts have risen, use parchment squares to transfer three donuts at a time to oil, top-side down; peel away parchment square. Fry donuts on first side until golden brown, 1 to 1½ minutes. 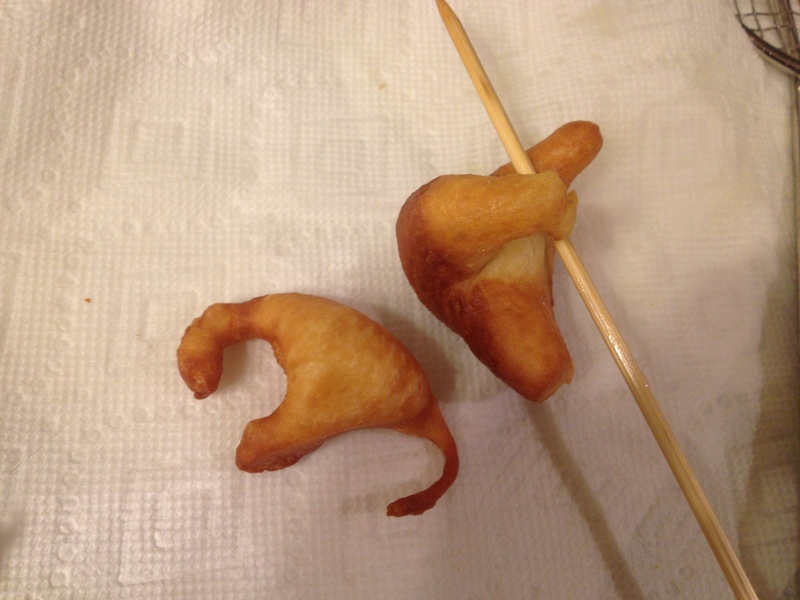 Flip donuts and fry on second side until golden brown, 1 to 1½ minutes longer. (Adjust burner as necessary to maintain oil temperature between 350 and 360.) Transfer donuts to paper-towel lined baking sheet, shaking off excess oil. Let drain for until still warm but cool enough to touch, then transfer with skewer or chopstick to saucepan of glaze and coat 1 or both sides. Top with almonds. Transfer glazed donuts to wire rack and let cool until glaze hardens before serving (if you can wait that long). 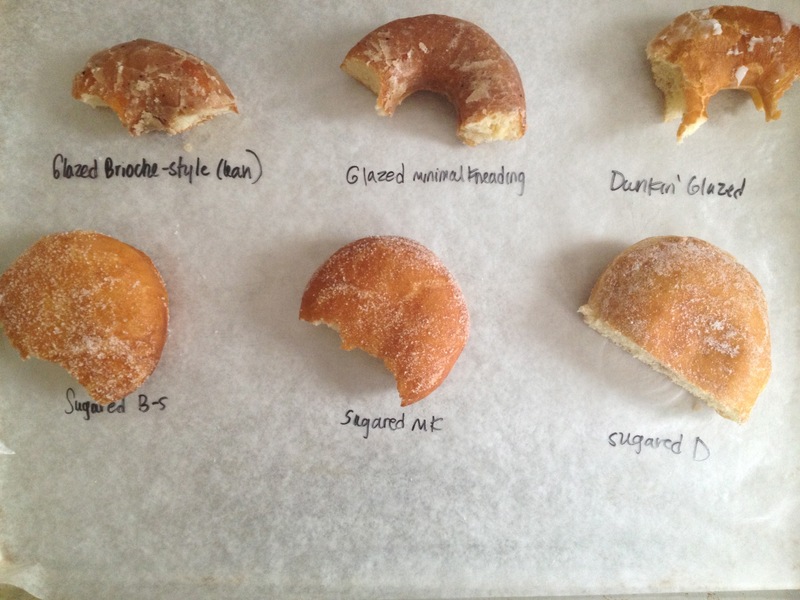 This is some serious donut research! It’s a hard job, but I guess someone has to do it ;-) yum. Absolutely love this post, and I am completely fascinated and impressed by your dedication to the process. Plus, the donuts just look darn delicious! Thanks so much, Taryn! That means a lot. I think I’m donut-ed out! I could have used the help! Girl, I really admire your dedication/obsession!! And now you have me craving donuts! I think I would prefer the cream-filled one but I won’t say no to glazed, either. Thanks so much, Bianca! I could have used your help with the eating :). that is my kind of recipe testing :) it’s hard work, but somebody has to do it! I think i’d be all over that coffee cardamom one… seriously drooling over my tea right now! Donut and tea: my favorite combo!